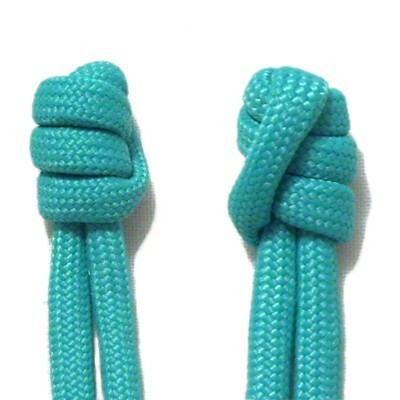 Description: The Barrel Knot is used frequently in Macrame projects. 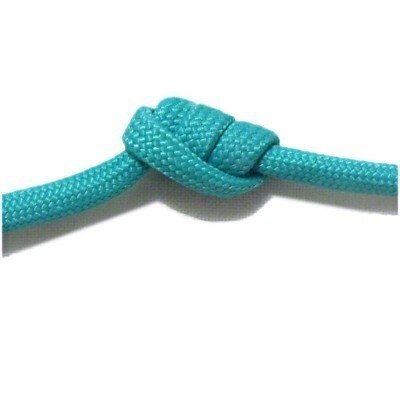 Its primarily used as a finishing knot at the ends of cords, to secure them or prevent them from unraveling. You can also use it any time you need a firm knot that doesn't come untied easily. This decorative knot is sometimes called the Coil Knot in vintage patterns. You may also see it called the Blood Knot. Also on this page are instructions for four variations you can use in your craft projects. Each one has its own special features. Beginners should practice all the variations and the basic design on this page. 2018 Update: The Bloody Knuckle Knot has been moved to it's own page. The 2-cord variation has been removed. Contact me if you need the original page. 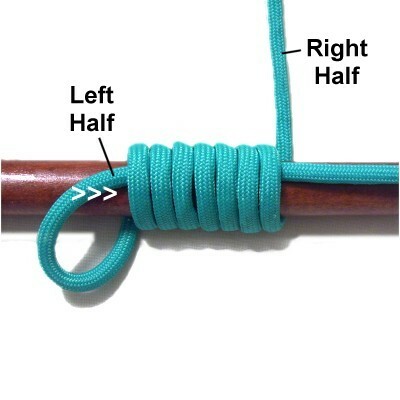 Description: This is the standard Barrel Knot most frequently used in Macrame projects. To practice, you need one cord at least 15 inches long. Step 1: Secure the cord to your board on your right. Arrange the working end vertically when you are done. Step 2: Wrap the working end around the secured portion under - over. This takes place to the left of the crossing point. Step 3: Wrap the working end around the secured portion a second time, placing it to the left of the first. Make sure both wraps are arranged neatly without overlapping. 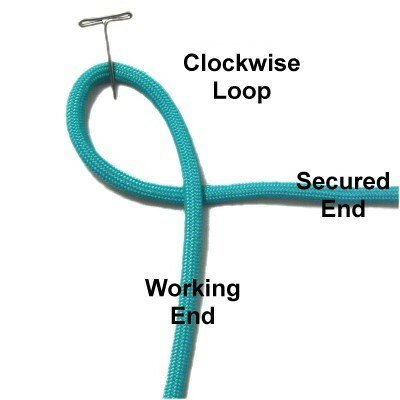 The best method is to remove the slack from the wraps first, then pull the secured end to tighten the loop. 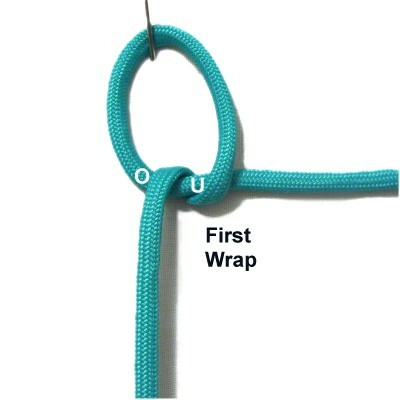 Description: This knot can be made longer by adding extra wraps. In the example shown, three wraps were made. I recommend you practice this variation with three wraps, then try four or five. Step 1: Repeat steps 1 - 3 from the basic design described previously. Wrap at least one more time, placing it to the left of the others. Step 2: Tighten the wrapped area first, then pull the secured end to tighten the loop. 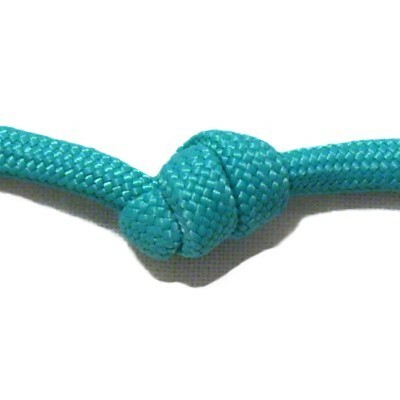 Description: This variation is called the Strangle Knot. 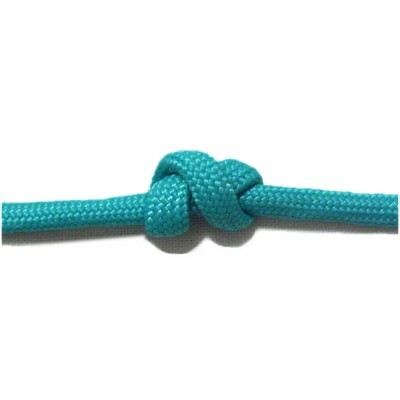 Like the regular Barrel knot, it is strong and difficult to untie. So it's great for slippery material. Step 1: Repeat steps 1 - 3 of the basic design. Mentally label the two segments shown in this image. Segment 2 leads to the working end. 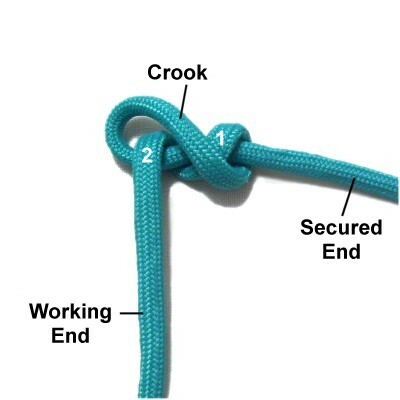 The top of the loop is called the crook. 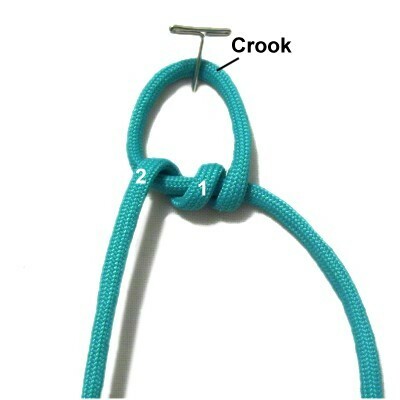 Step 2: Move the top of the loop (crook) toward you, so it rests between segments 1 and 2 diagonally. Push segment 1 to the right if necessary, forming a figure 8 shape. 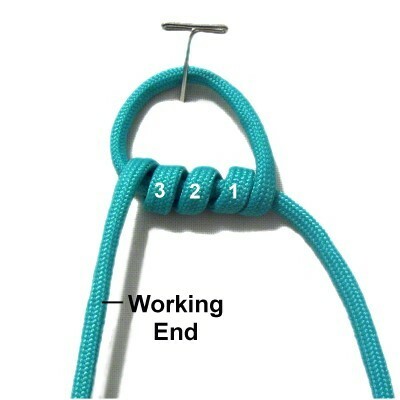 Tighten the knot by pulling on both ends gradually. Make sure you hold the knot to keep the figure 8 shape as you tighten. 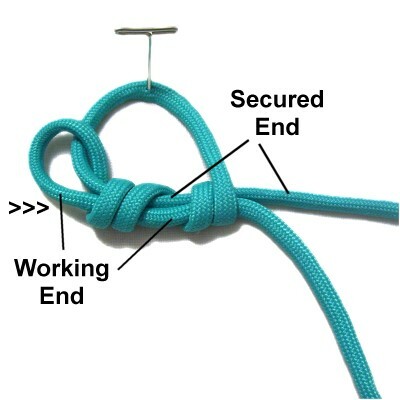 Description: This variation is often used when you want the two ends to exit the knot horizontally. 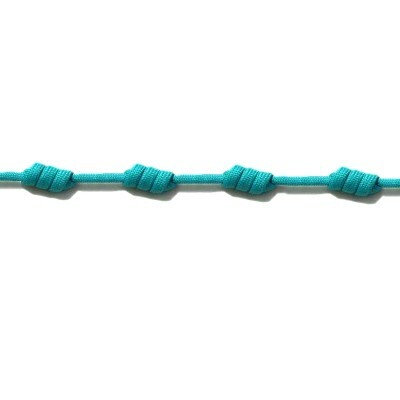 To distinguish it from the regular Barrel knot, I call it the Barrel Bead, since it resembles a tube shaped bead. It can be used to decorate a long segment of material, such as when you are making a fringe. I found this design in "Decorative Fusion Knots". 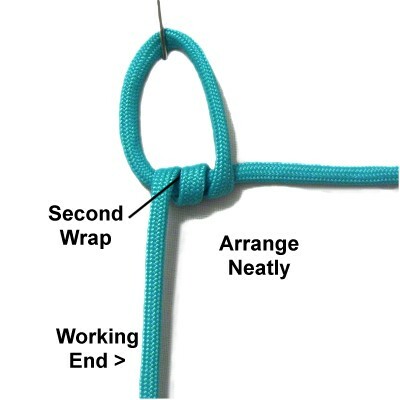 Click on the link or image to see the Fusion Knots website, which has a video gallery with tutorials for a variety of unique decorative knots. Preparation: You need once cord to practice, at least 30 inches long. 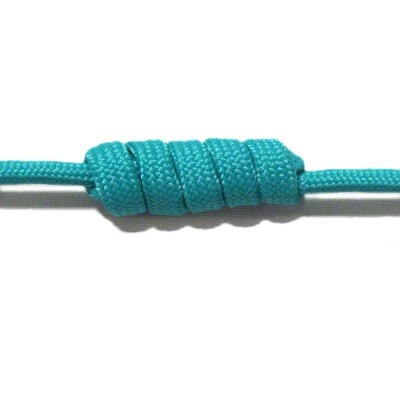 You can make this knot around a dowel as shown, or around your fingers. 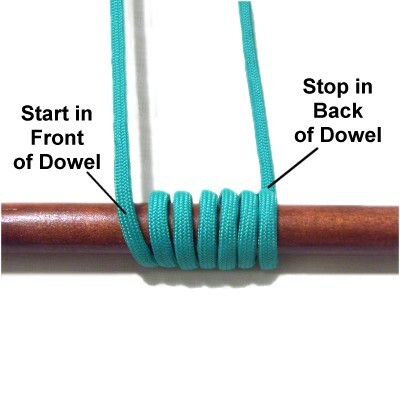 Step 1: Place one end of the cord in front of the dowel to your left. You can secure it if you wish. Wrap it around the dowel several times, moving right. Make sure you stop with the cord resting in back of the dowel. Step 2: Pass the left half of the cord through the wrapped area, moving left to right. Move it down slightly, closer to the bottom of the dowel where it rests on your work surface. Step 3: Pass the right half through wrapped area, moving right to left. It should rest above the other half of the cord, closer to the top of the dowel. Step 4: Tighten the knot as much as possible on the dowel, then slide it off and tighten it until firm. You may need to help by pushing the wraps close together. 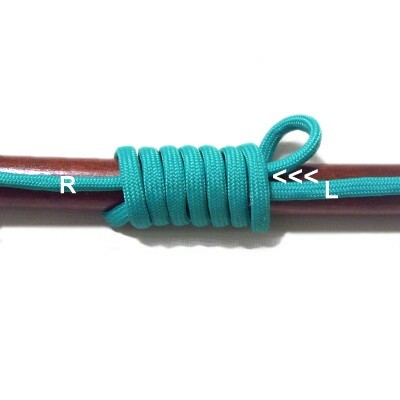 Step 5 (Optional): Tie at least one more Barrel knot with the same cord to gain experience. 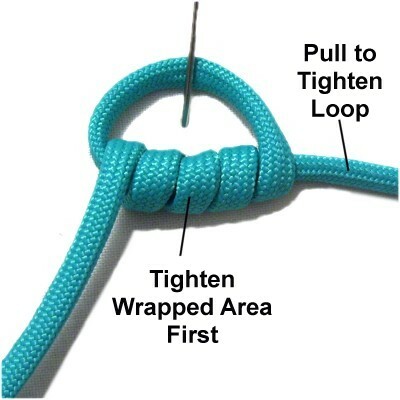 When you pass the ends through the wraps, bring the previous knots through, too. 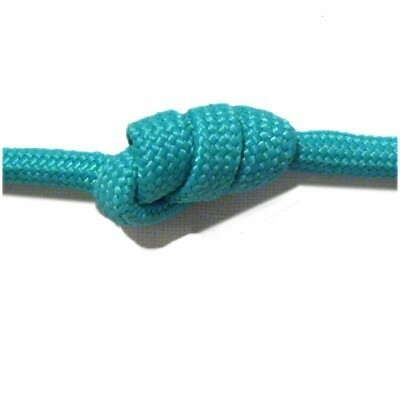 Try to tighten so there is equal space between each knot. Description: For want of a better name, I call this variation the Barrel Tuck. The advantage to using it is that both ends come out of the knot next to each other, rather than one on each side. 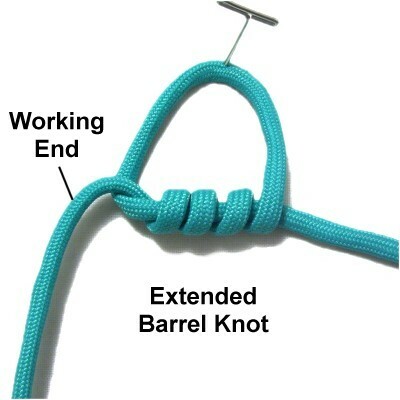 Step 1: Create an extended Barrel knot as described in the second set of instructions above, making at least 3 wraps. Step 2: Pass the working end through the wrapped area, moving left to right. It should rest in front of the secured end of the cord. Step 3: Pull on the working end to tighten the wrapped portion. Then pull the secured end to tighten the loop. 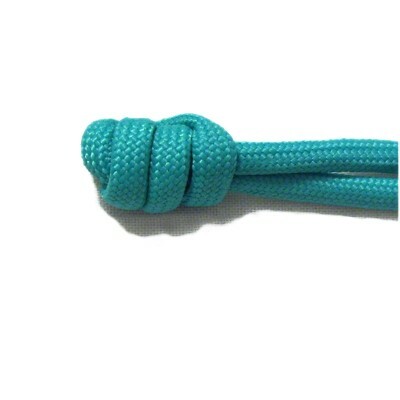 Have any comments about the Barrel Knot? Contact Me.